Travel In the Footsteps of Bond, Bourne and Beyond! Have you ever wanted to travel to the exotic places portrayed in the James Bond films? Well, if you act quickly, you can take advantage of a unique theme travel event: Operation EURO2010:Bond, Bourne and Beyond. The folks at Theme Party People are taking 45 people on an exclusive tour of Italy, Switzerland and France with access to the film locations and lifestyle of James Bond, Jason Bourne and a host of other famous film characters. “Our ‘mission’ will be to bring the filmmakers perspective to the locations we are visiting and share insights to the film productions for our guests,” say Richard and Leslie Skillman the team behind Theme Party People. 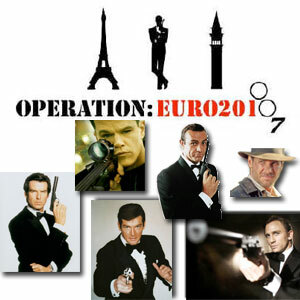 Operation EURO2010 is an exclusive 11 Day Bus/Train tour of Europe, as seen and experienced through James Bond’s most famous films, as well as visits to other film sites from The Bourne Identity, Star Wars, Indiana Jones and the Last Crusade and more! Full mission details can be found here.